Photo during field work by Prof. Dan Obenour and PhD student Alexey Katin of the Neuse River Estuary at Highway 17. 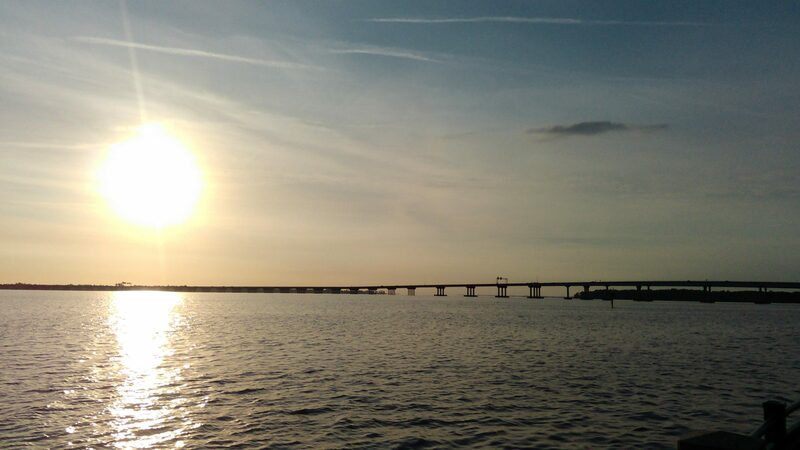 Last June, a team of researchers used an experimental model to forecast that hypoxia — low levels of dissolved oxygen — would be more severe than average in the Neuse River Estuary during midsummer 2018. Such predictive models are important, because hypoxia can lead to ecosystem stresses, including fish kills. Assistant Professor Dan Obenour and PhD student Alexey Katin collaborated with coastal ecologist Hans Paerl of the UNC-CH Institute of Marine Sciences on this North Carolina Sea Grant project. The summer of 2018 was wet. From May through August, the mean Neuse River discharge — a measure of the volume of water flowing into the estuary — was twice as high as the historical average. These high flows deliver nutrients and promote water-column stratification, which leads to depletion of dissolved oxygen. At the beginning of July, winds from Tropical Storm Chris mixed and oxygenated bottom waters throughout the estuary. Unfortunately, we have no observations of conditions in late July after this storm event, because the sampling cruise was canceled due to maintenance. During the second half of July and the beginning of August, the estuary continued to receive substantial fresh water and nutrients from upstream. As a result, the whole estuary became severely hypoxic, with levels of bottom-water dissolved oxygen less than 1 milligram per liter during August. The absence of strong winds and precipitation that month maintained hypoxic conditions until the beginning of September, and monitoring staff reported fish kills. Observations following Hurricane Florence in late September and October indicated severe hypoxia continued into the fall. When the team later assessed how well their experimental model had anticipated oxygen levels, they determined their forecast effectively matched observed conditions — and they also found significant impacts on the estuary from Tropical Storm Chris and Hurricane Florence. To see how their forecasts compared with the observed conditions, please read the full article at North Carolina Sea Grant.